Charley who does the marketing at Charley's Gift Shop has a tricky job. She needs to personalize the experience of all her customers across all channels! It's just got easier. Charley creates one email and sends it to her whole list. She has created different smartblocks, which will show to customers paired with product recommendations based on their most frequently browsed category. These smartblock banners and recommendations will be repeated on the homepage of the website when Charleys customers view it, completely congruent with the email content. Data is collected in real-time as the customer is browsing the website, updating the smartblocks to correspond the activity. This means recommendations and banners will update in real-time to give a seamless customer experience, only seeing content that is still relevant to them, and Charley can sit back and watch the sales increase. Charley is smart. Be like Charley. Q: How do I switch to a different SmartBlock in real-time, even after emails have been sent? A: Edit the slot rules. How to put a Real-Time Banner In Your Emails. How to use Rules to Show Customers the Perfect Content. 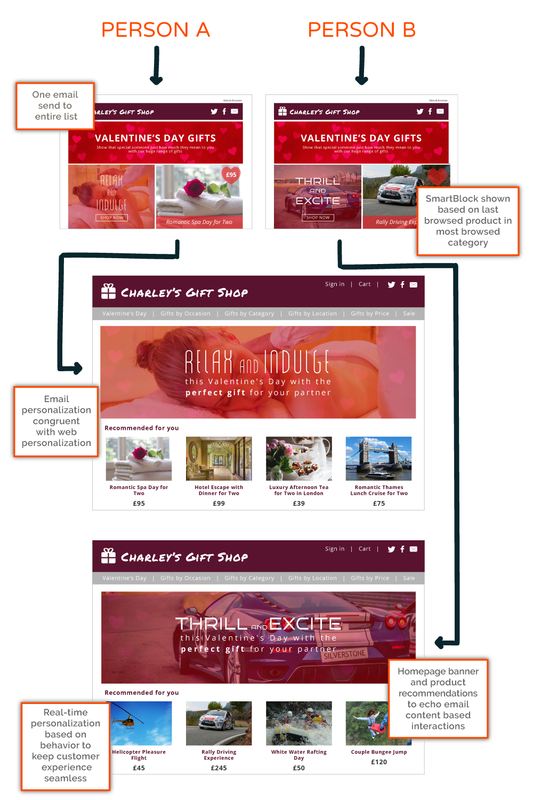 Design Bulk Emails Using Fresh Relevance Features.